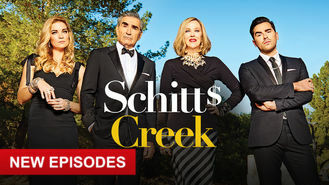 Schitt's Creek (2015) on Netflix Ireland. Check worldwide Netflix availability! If Schitt's Creek isn't available in your country, or you are visiting a country where it isn't, there is still a way to watch it! Suddenly broke, the formerly filthy-rich Rose family is reduced to living in a ramshackle motel in a town they once bought as a joke: Schitt's Creek. When a wealthy family is forced to find out how the other half lives, the adjustment isn't exactly a smooth one.